For many years Margaret Ryall’s interest in art was displayed through the promotion of visual art in the elementary schools where she was a teacher and administrator. In 2001 she made a career shift to visual arts and hasn’t looked back. Margaret has developed an art practice that is focused and productive. Since 2002, she has participated in over 30 group exhibitions in Newfoundland and Labrador. Her recent solo exhibition –Remnants – was held at The Leyton Gallery of Fine Art in May. Her work can be found in private and public collections. 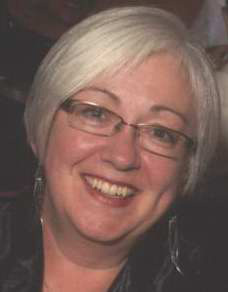 As an active member of the arts community in Newfoundland and Labrador, Margaret recently completed two terms on the board of VANL-CARFAC and currently serves as Secretary on the CARFAC National Board. Through her work, Margaret wants to evoke a sense of precarious beauty through a close inspection of the ordinary. Discarded artifacts, debris from collapsed buildings, and flowers form content in her work. Her subject matter consistently links nature, culture and the passage of time. 1. When did you first realize that you wanted to become an artist? I didn’t decide to be an artist until 2001. Possibly it was a combination of my recent retirement and the hot sun pounding down on my head in a sunflower field in France that accounted for this impetuous decision. 2. What mediums do you work in and why? My work is mixed media, consisting of acrylic paints and gels, colored pencils, charcoal, phototransfer, ephemera, and paper. In the last year, I’ve also added wax, oil paint and oil pastel to this mix. Over the last seven years, I gave every medium a fair chance and found that acrylics work best with my temperament and my need to layer and resolve things as I work. For me, painting is as much about the process as it is about the final outcome. I like monotype and collograph, and I often use parts of my unsuccessful printmaking adventures in my mixed media works. 3. How do you get ideas for your artwork? I am interested in what is around me both in the natural and man made world – the simple things that often get overlooked by others. My summer home in Duntara is on the ocean and my time there has contributed to “slowing down” and taking a closer look at the world. In these quiet times, I also write poetry which sometimes leads to art work. Travel has broadened my interests and given me the opportunity to observe different cultures. I collect books and ephemera during my travels. I keep a journal where I jot down all sorts of foolishness from time to time, including: quotes, sketches of what I will do, how I might do things or questions I have. I keep several collection files where you will find an assortment of images ranging from pictures from art magazines to scraps of gift wrap and old postcards. In the last two years photography has crept into my work as phototransfers. As a result, I am taking many photographs that I sort and re-sort in different ways. This process allows me to look at an experience with new eyes. Many of my recent works were born during this categorizing process. 4. What other artists influence your artwork? I think every piece of art you see contributes to your understanding of art and impacts your practice in some way. It all gets filed away mentally and comes back to you in various ways. Two artists currently on my bookshelf are Robert Kushner, whose brazen use of decorative motifs parallels my need to connect nature and culture in what I do; and, Fred Otnes, who creates subtle, large scale collage works that I envy every time I see one – they are impressive in real life. My most important influences come from artists I have direct contact with and who have been supportive of my desire to be an artist. They include the teachers I had in the early stages of my art career and artists who encourage me along the way through the critique process or by just listening to my ramblings. The opportunity to talk about your art gets you out of your own head and forces you to really look at what you are doing. 5. What are the ‘big’ themes in your artwork? I am interested in the passage of time and the effects it has on life, memory and identity. The relationship between nature and culture is also evident in my work. 6. What is the greatest challenge you face as an artist working in Newfoundland and Labrador? When you travel, you quickly become aware that the visual arts scene in Newfoundland is thriving because of the number of people involved. You also realize that we are impacted by our geographical isolation in terms of venues to show work and opportunities to see a wide range of work. The whole idea of moving my work beyond a St. John’s audience is currently very challenging for me. 7. What is the best thing about working as an artist in this province? The best aspect of working in this province is that it’s small enough to get to know who’s who quickly and this allows you to build a support network. Sometimes this can also be the worst aspect of working in the province. Hopefully still alive and creating art! Each year I have more confidence in what I am doing and I trust my instincts to lead me where I need to go. I honour those instincts with hard work and planning. We all want to be “successful”, but I haven’t yet decided what that success will look like for me in ten years. 9. If you weren’t an artist, what would you be doing? I would be retired and probably very bored and unfulfilled creatively and serving on too many boards to fill in the time when I’m wasn’t actively being a grandmother. I’m sure I would still be looking at art, reading about it and wishing I could buy more of it. 10. If you could have one wish granted, what would it be? Coming to art from many years in education, I would love to see excellent resources, including enough teachers with concentrations in art education, as well as consumable and print materials, to support the new art curriculum currently coming on stream in the province. There were no art courses in my schooling and I am very aware of what I missed; I want it there in spades for coming generations. Want to be our next Member of the Month? Submit your answers to the 10 Questions listed above, plus a jpeg photo and a short bio before the first Monday of each month to be entered in the random draw. All submissions should be emailed to sara@vanl-carfac.com.